One of the most documented vehicles in the Riding fleet was Seddon Atkinson Strato 4x2 tractor unit Reg No F500 BFV Fleet No 24 'Invincible'. 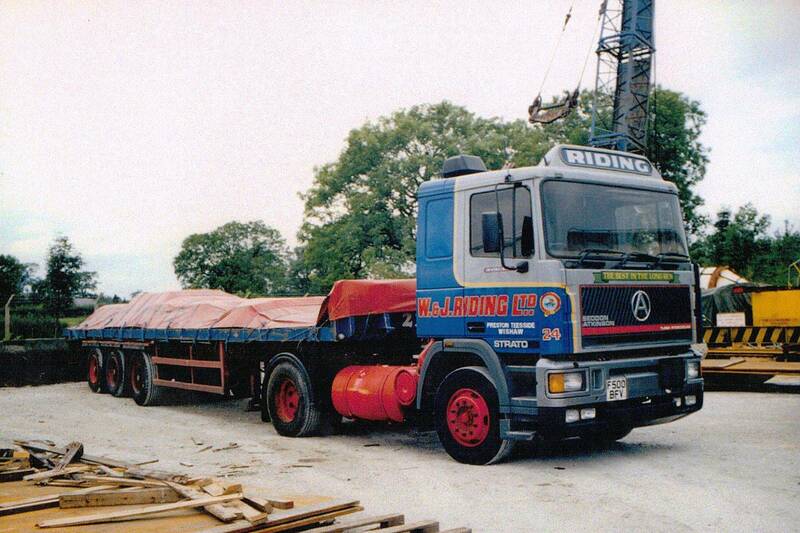 Registered new on the 1st of May 1989 at a cost of £30.027.65p + vat this was the first brand new Seddon Atkinson Strato to enter service with the company. Powered by a Cummins L10 325 it was the first one off the production line to be fitted with this size of engine. Driven from new by Reg Nuttall it unfortunately did not live up to it's name of 'Invincible' as it was written off in May 1996 after being burnt out following a fire which started in a front wheel hub. In 2012 Corgi released a 1:50 scale model based on this particular vehicle with a limited production run of 750. Click on any image below to view full size. 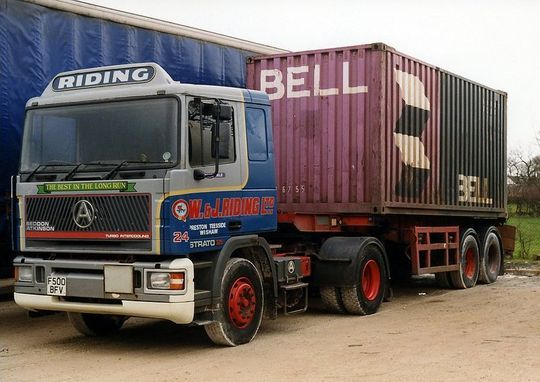 An excellent shot of what was the first brand new Seddon Atkinson Strato 4x2 tractor unit to enter service with Riding's on the 1st of May 1989. Pictured here at Longridge depot, with driver Thurston Greenall roping up, Reg No F500 BFV Fleet No 24 'Invincible' cost £30.027.65p + vat and was powered by a Cummins L10 325 engine. All subsequent brand new Strato's in the Riding fleet would be powered by the Perkins 335TX engine. Driven from new by Reg Nuttall Reg No 500 BFV Fleet No 24 'Invincible' is seen here in July 1991 with a load of steel while parked in the depot at Longridge. Photograph courtesy of Chris Richards.. 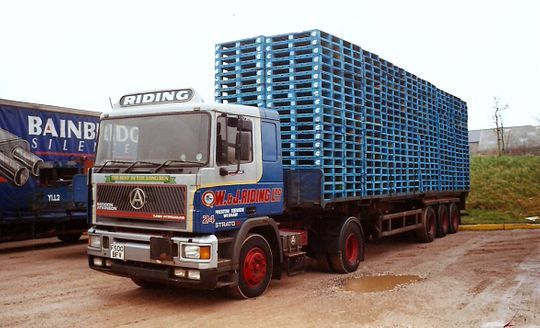 The 26th of March 1995 and Seddon Atkinson Strato 4x2 tractor unit Reg No F500 BFV Fleet No 24 'Invincible' is seen here parked up in Longridge after being in service with Riding's for six years. It is seen here coupled to a tandem axle skelly trailer with 20 foot Bell Line container on board. 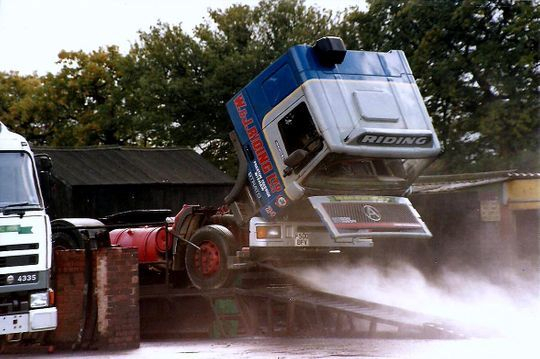 Seddon Atkinson Strato 4x2 tractor unit Reg No F500 BFV Fleet No 24 'Invincible' is pictured on the steam cleaning ramp at Longridge depot undergoing cleaning for it's annual MOT test. Photograph courtesy of Chris Richards. 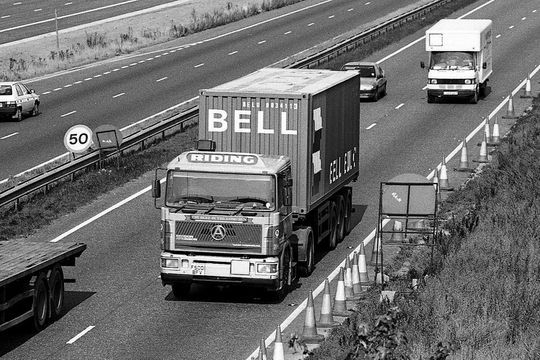 A nice on the road shot of Seddon Atkinson Strato 4x2 tractor unit Reg No F500 BFV Fleet No 24 'Invincible' as it heads down the motorway hauling a 33 foot tri-axle skelly trailer with a standard 30 foot Bell container on board. 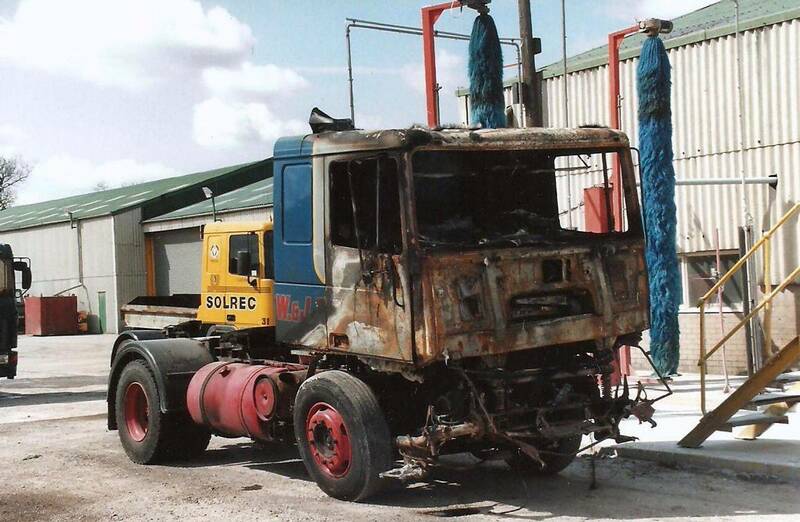 Over the years, while being allocated to the general haulage fleet, Seddon Atkinson Strato 4x2 tractor unit Reg No F500 BFV Fleet No 24 'Invincible' was used on a variety of work. In this picture taken in the depot at Longridge it is seen here loaded with empty GKN pallets destined for the H J Heinz Co Ltd factory at Kitt Green near Wigan. Unfortunately Seddon Atkinson Strato Reg No F500 BFV did not live up to it's name of 'Invincible' as it was written off after being burnt out following a fire which started in a front wheel hub. 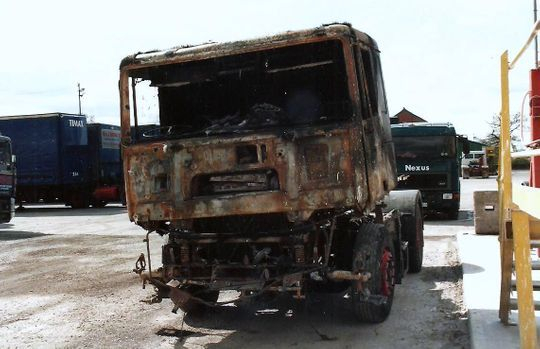 The burnt out remains of F500 BFV are pictured here in the depot at Longridge on the 4th of May 1996 shortly after being recovered. Another shot taken in the depot at Longridge shows the burnt out remains of Seddon Atkinson Strato Reg No F500 BFV. Classed as a total write off the remains were broken up for scrap. Released in 2012 this particular Corgi scale model was based on Reg No F500 BFV Fleet No 24 'Invincible'. Costing £30.027.65p + vat when new in 1989 that was slightly more than the recommended price of £88.99 for the 1:50 scale Corgi model.